Jan 05, 2017: Will These fit with this mobo?!?! Jan 09, 2017: Whitebox P2P hub build help. Feb 02, 2017: Those who have built a few TonyMac builds: What would you do differently now than before? Feb 15, 2017: Just brought 6x8TB reds in the Amazon deal and need help. May 27, 2017: Post your Mac compatible SATA/SAS cards here. Nov 29, 2017: Is a RAID controller card my best option? Dec 15, 2017: Help with controller card? Jan 16, 2019: Any reasons not to get this card? I dont need RAID or anything fancy, just ports for shucked easystores for my Plex server. Jan 22, 2019: Is this card Compatible with Unraid? Feb 11, 2019: So what are the odds i got two bad Dell H310s in a row vs me doing something wrong? 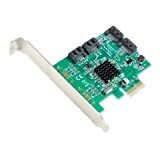 Feb 18, 2019: PCI-Express 2.0 X1 sata expansion card with IT mode?